The two tricks to downloading files while staying safe from malware are to only download from sites you trust and to never download file attachments to emails that you aren’t completely sure are safe. The most dangerous files to download are executable files that sport an .exe extension at the end of the filename. Clicking on these will run a program of some kind, and could therefore pose an active threat. Open a trusted website that contains downloadable files. Typically, websites offer a Download button or link that initiates a file download. Click the appropriate link or button to proceed. (This button often is called Download, but on the Adobe site, it may be called Install.) Windows might display a dialog box asking your permission to proceed with the download; click Yes. The download also might open in a separate Microsoft Edge window in some cases. For an executable file, click Run to download the file to a temporary folder. You can run a software installation program, for example. However, beware: If you run a program you obtained from the Internet, you could be introducing dangerous viruses to your system. You might want to set up an antivirus program to scan files before downloading them. For a document file, such as a PDF file, click Open to open the file in another browser tab or the app that’s installed on your computer for that type of document. For executable files, consider using an antivirus program to scan them before opening the files. For any type of file, click View Downloads. The Hub opens and shows you recent downloads, as shown in the following figure. 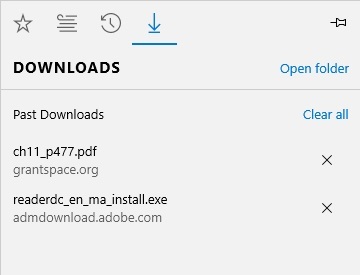 You can click the Clear (X) button beside a download to remove it from the list, or click Clear All to clear the list of past downloads. Or, you can click Open Folder to open your Downloads folder to work with downloaded files. Press Esc or click elsewhere on the browser window to close the Hub pane. The Downloads folder is one of your default user folders. Note that you can download some website picture files by right-clicking and clicking Save Picture. Make sure you have the proper permissions to use any content you download from the Web. If you’re worried that a particular file might be unsafe to download (for example, if it’s from an unknown source, or if you discover that it’s an executable file type, which could contain a virus), click Cancel in the download toolbar. If a particular file will take a long time to download (some can take 20 minutes or more), you may have to babysit it. If your computer goes into standby mode, it could pause the download. If your computer automatically downloads Windows updates, it may cause your computer to restart automatically as well, cancelling or halting your download. Check in periodically to keep things moving along.